Place a soup pot over medium-high heat and add 2 tablespoons of the oil. When the oil is shimmering, add the onion and garlic and sauté for a few minutes, until the onion is translucent; season with salt and pepper. Next, add the tomatoes and their juices and bring to a boil. Reduce to a simmer and cook until the tomatoes begin to soften and break down into a chunky pulp, about 5 minutes. Toss in the basil leaves and bread. Cook, stirring gently, until the bread gets very soft and absorbs the liquid, about 5 minutes. Push the bread pieces down with a wooden spoon if they float to the top. Reduce the heat to low, cover, and cook for 15 minutes. Add the ¼ cup olive oil and remove from heat. Working in batches, ladle the soup into a blender filling it no more than halfway. Purée for a few seconds until completely smooth. 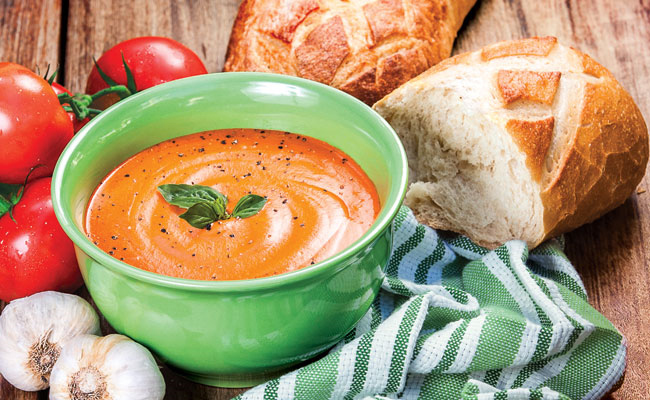 To serve, pour the tomato soup into bowls, season with salt and pepper, drizzle with olive oil, and garnish with parsley and a swirl of crème fraîche.